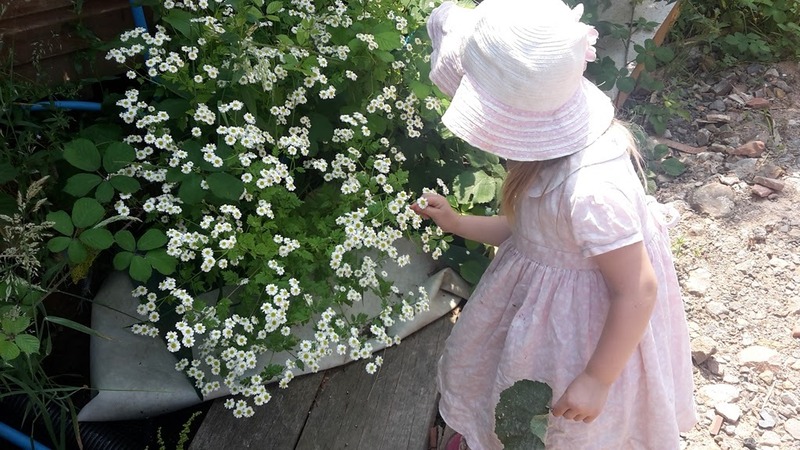 It's probably one of those common wild flowers that as you grow they become familiar (does that happen to children these days?). I use the Garrad and Streeter book too. 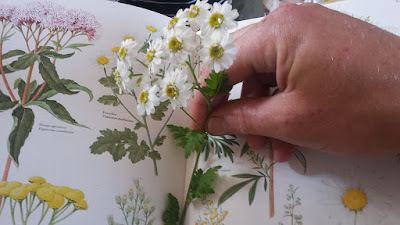 My favourite, though not sure much for identification, is Flora Britannica by Richard Mabey (of Food for Free fame) which is full of the folk and medicinal history of British wild plants. I have quite a few by Roger Phillips as well, they're really good for identification. I haev one on trees and one on mushrooms as well as a wild food cook book he did (really good read). I do love food for free so I'll keep an eye out for his other one. I'm terrible with books and have far too many! You know I thought the one here was feverfew, but it has a tiny bit longer petals, and slightly less of them than yours. Might be because of being in the USA, but now I'm wondering if the ones here are just common wild daisies.Will have to check on that. They might be different over there or there might be variation between plants. The leaves are the giveaway I think, they match perfectly with the ones in the book. Bitter as anything to eat though. Hi Kev, there are women's face creams on the market that have feverfew in them, the claim is to reduce aging and wrinkles, but I don't know how effective that is considering they load the creams with chemicals anyway. But maybe in some kind of homemade cream it would be good for the skin? Awesome that you can tell what's what from a book. Whatever skill that is, I lack it lol. Just recently we told our GK's about encyclopedias. They were not familiar with them at all. They are 9 and 13. The 9 year old was especially awestruck and spent the evening just reading the Volume "K" Limiting the screen time. That's what this Yaya does. My gran fave it to us when we were kids, it brings down sweats as well as headaches. I am not sure it is strong enough for a full blown migraine, but if you know you have one coming (for me this is twinkling lights around objects think the ready brek man), then I eat the leaves in a sandwich. My gran fave it to us when we were kids.